After meeting Sir Robert Baden-Powell, founder of the Boy Scouts and Girl Guides, Juliette Gordon Low started Girl Scouts in the United States 1912. The program was designed to teach girls self-sufficiency and life skills while having fun. 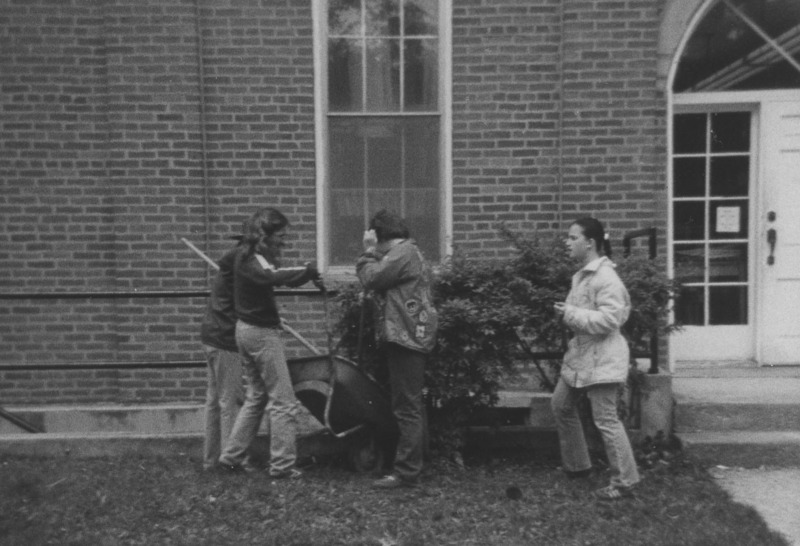 Not only did her program take the girls into the outdoors, if broaden their knowledge of the arts and sciences which they would one day use as career women or housewives and mothers. Organizational and leadership skills were built into the program. Merit badges rewarded the girls for excelling in their pursuit of knowledge. Community service is a big part of the program. The girls learn no one is an island and learn the joy of helping others. I am not sure when the earliest troops began in Sunbury. If you know of an earlier one, please contact me. I do know Dorothy Dillenbeck married Carleton Burrer in 1945 and moved to Sunbury. As a young girl she had been in one of the first Girls Scout Troops in New York. I am sure she was an influence on my mother, Marian Whitney, and encouraged her to get into scouting. Below is our Brownie troop at the roadside park just north of town on the Old CCC. Not sure why nurse Betty Owen is in the photo but she might have been doing a first aid project with us that day. Marian Whitney and Mary Ellen Main were the leaders. This has to be the summer after first grade as Peg Main and I each had sisters the next year younger and they are not yet in Brownies. 7. Mary Lou Lake, 8. 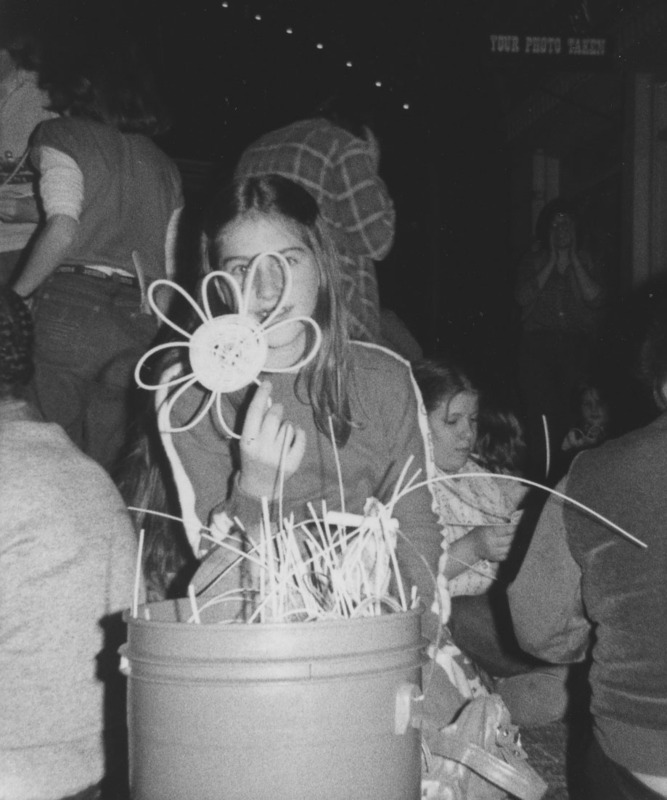 Peggy Livingston, 9. Polly Whiney, 10. Peggy Main. Marian Whitney continued with the girls through Brownies and Girl Scouts. 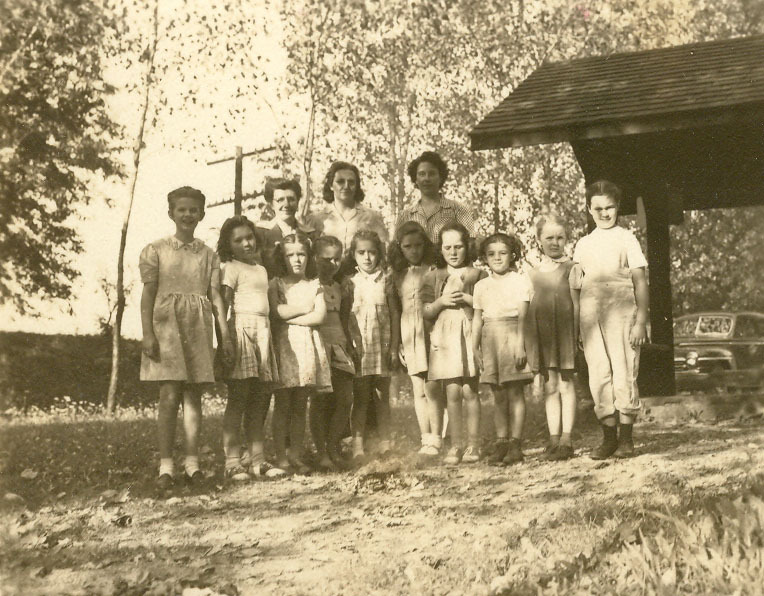 Day Camp was held in the park behind Jane Case Hospital (now Grady) in Delaware. Suzanne (Link) Allen remembers the sit-up-ons we were all required to have. Usually we made these from oil cloth padded with and old bath towel. They tied around our waist so he could quickly sit anywhere. I was more impressed with my girl scout knife with all the blades. I still have mine. My sister Peg (Whitney) Stephens always carried hers when she traveled but after 911 she had to run to a gift shop and have the knife mailed home when they were going to take it in the airport. Of course one could not have a knife without a braided lanyard. We progressed from Day Camp to residence camp at Camp Ken Jockety at Galloway. One summer when I was seven, I went for two weeks and called home at the end of the time and got permission to stay 2 more weeks. Then they had 2 openings so my sister and I both stayed 2 more weeks. After 6 weeks in camp my mother refused to let me stay another session. In future years she made sure I understood I was only going for 1 session. I remember little spiders on my pillow during the end of the first session. One morning I woke up covered with little red dots all over my face. I was sent to the nurse for measles. She called my mother to discover I had already had them and I confessed about the spiders. All the girls were taken out of the tent and the spiders were eradicated. Our troop went to Francis Slack's house to work on home nursing. We all learned to make a bed with square corners, give baths in bed, roll a sick person as well as basic first aid. Have to admit I thought I would never use some of the skills but when I became a caregiver for my grandparents, the knowledge was very useful. Mrs. 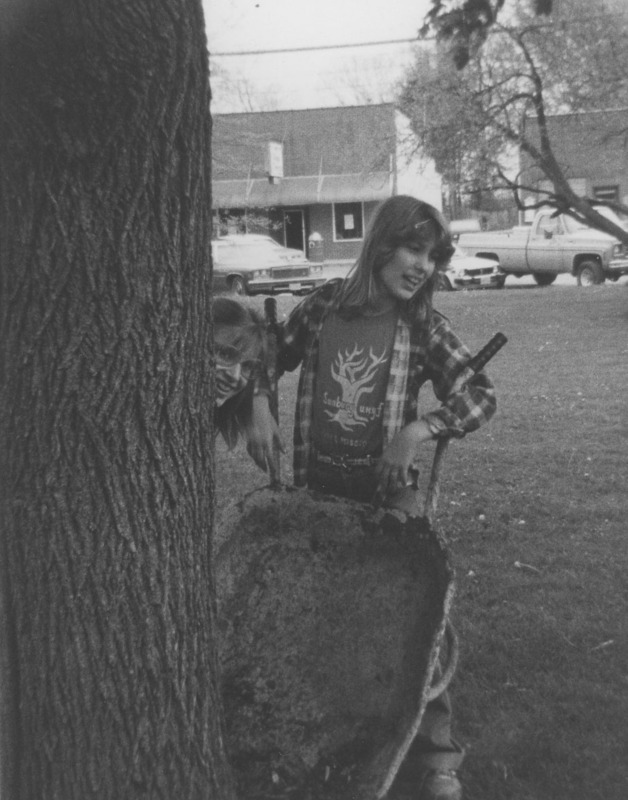 Slack later had a troop of girls that age of her daughter Susan. As the years went by older girls moved on and younger girls were added to our troop #3. We sold canned nuts and Girl Scout Cookies to raise money for trips and camping. Our badge sashes filled with badges earned independently as well as with the troop. We visited nursing homes, marched in Memorial Day parades and participated in any community events. Our high school troop became a Mariner's Troop because we were interested in water skills and we liked the blue uniforms. Sashes became vests to hold the badges. 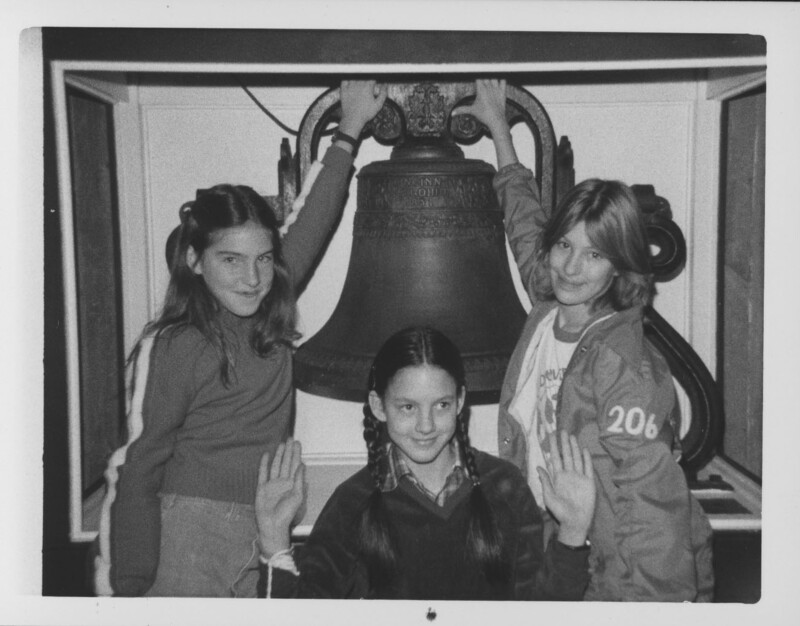 When I was in high school I began to help Pauline Livingston and Laura Whitney with their Brownie Troop which met in the Methodist Church basement on North Columbus Street. I usually took them outside for games and fixed the refreshments while the girls held their business meeting. I remember teaching them to braid bracelets with plastic cord. Camp Wakatomika near Newark became the favorite residence camp. It was more primitive and had a beautiful setting. Following my Sophomore and Junior years, I became a Counselor-In-Training (CIT). The program was a two month program designed to round out your leadership skills as well as outdoor skills. There were 24 of us the first summer but only 9 the second one. We had excellent leaders. Not only did we build our own hogan to live in, dug our latrine (dubbed the Coke Room for the pause that refreshes), we spent a week in the wilderness on our own. We each took one food item and one piece of equipment with clothes, sleeping bags and tents. This took planning and fortitude but we all successfully completed the challenge. From then on, I knew if one is prepared one can do anything. at the Juliet Low Tea in Delaware. When Slacks moved, Mrs. Slack had to give up her girls so Mrs. Whitney continued on with them even though my sister and I were out of highschool. We continued to meet with them in the summers and during holidays. 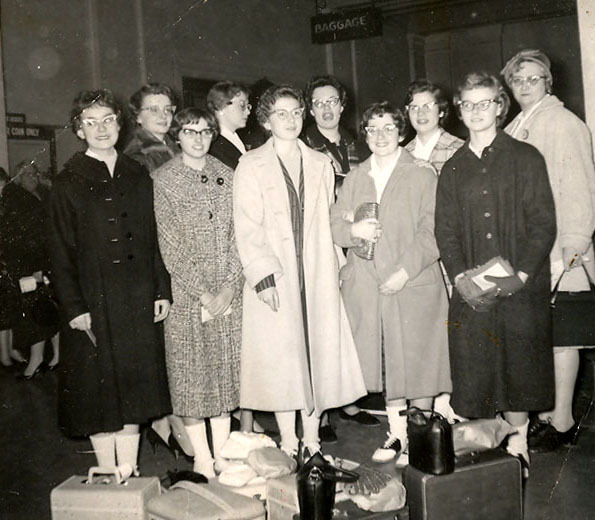 We had been saving money to go to Europe but the international scene was shaky and the parents had not raised their half of the money so Mrs. Whitney and Mrs. Hoover agreed to take the troop to New York on a Dispatch theater trip.. We left the day after Christmas and stayed through New Year's Eve in a hotel overlooking Times Square. We saw Broadway plays every afternoon and evening and all the New York sights during the other times. Watching the ball fall on New Year's Eve was a real thrill even though we watched from our hotel rooms. Ann Bodeman and Marian Whitney. Not in the photo are Brenda and Helen Hoover. Other Troops in Sunbury were Troop 39 with Mrs.. Laura Whitney, leader. Mrs. Emerson Mathews led Troop #42 in Galena. 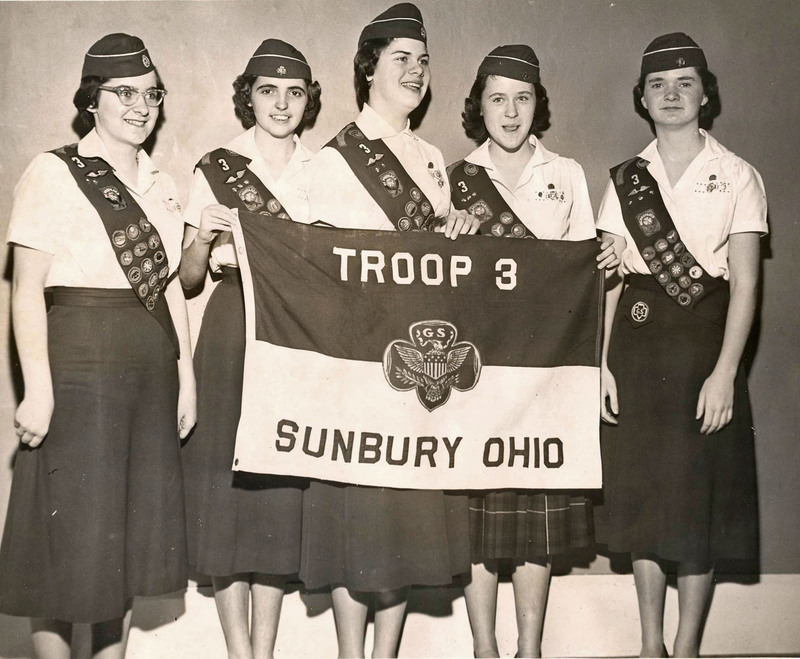 Mrs. Ruby Nettlehorst and Mrs. Aleta Stith led Troop #40 in Sunbury. Not sure what happened to Girl Scouts from the time the girls graduated in 1959 until the mid 60s when Marty (Stith) Jones began meeting with a troop in the Big Walnut High School on Baughman Street. As a girl Marty had been in Marian Whitney's Brownie troop but was unable to continue in scouting. All though none of her children were in the troop, she met with a dozen girls for about 6 years while many of them finished the highest award. They sold cookies and held bake sales to buy camping equipment so they could do primitive camping at the Big Walnut Conservation Club. In addition to pit cooking, the scouts learned Trail Blazing and other outdoor skills. 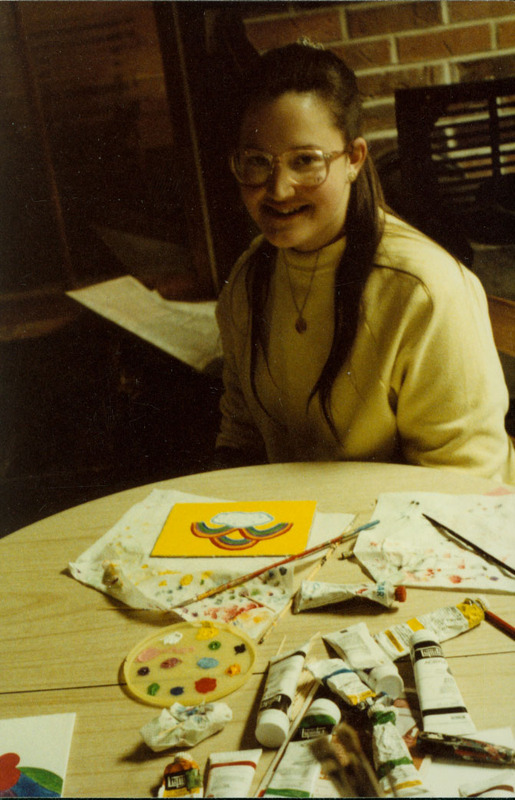 "I always felt the Girl Scout program was spiritually and mentally up lifting for the girls. I was pleased to note none got into drugs or alcohol," noted Marty. Mary McClintock had a troop of younger girls and eventually took over Marty's troop. I am not sure how long Mrs. McClintock had her troop. When the Seal of Ohio held a scout sign up in 1975, I took on a Brownie troop with my first grade daughter and others in first and second grades. 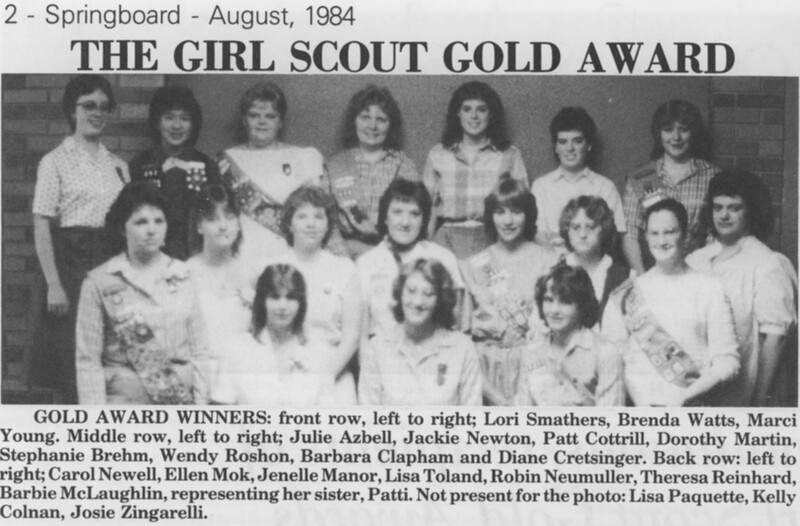 Judy Johnson and Joan Fuller and I had 24 girls in Troop 1211. As the year went on we picked up Christie Manor as a leader and her two daughter. The following year we split the troop and Mrs. Manor took the older girls and I took the others and added some younger girls and Brigitta Lambert as a leader. The next year we picked up Rosie Mohler and Bobbi Herd. We now had 36 girls, 12 in Manor's and a third troop in the Gardens had 15 girls. The following year we split the troop with Mrs. Mohler and Mrs. Herd taking the younger girls. The leaders were terrific and made the whole experience enjoyable for all of us. The American Legion allowed us to meet in their hall each week. This was perfect walking distance from the school. We tried to help them by selling poppies for veterans and putting flags on veterans graves in the cemetery. We marched in Memorial Day parades and participated in the service as flag holders. We also were in the July 4th parades as a unit. Sometimes we marched, sometimes we rode a float or our bikes. We also helped clean up the school grounds after the 4th celebration. We never had to hunt for community service projects because word got around that we were willing to help. In addition to the regular Brownie program, we added overnight camping in our woods. On the first overnight we had rain and an electrical storm so we needed to get the girls off the ground and under cover. We moved their sleeping bags into the greenhouse on the property and went back outside for breakfast. - - -Of course we still made sit-up-ons and knife lanyards. Day Camp was held at Whetstone Park for the girls in Delaware, Powell, Olentangy and Big Walnut service unit. Our troops were multiplying quickly so we started a Big Walnut-Olentangy Service Unit. This helped but eventually we needed to hold our meetings at night to accommodate the employed leaders so the Big Walnut Service Unit was formed. We ran our day camp at the Big Walnut Conservation Club with a campout the last night. Think we had about 200 girls on my last campout. In the fall of 1982 I turned the Big Walnut Service Unit over to Mrs. Bruce Mathews with 14 troops in the Big Walnut Schools. When she moved, Rosie Mohler became the Service Unit Coordinator. We soon out grew the Brownie progran and flew up to Girls Scouts. Badges and camping were still big but we added COSI into the mix. 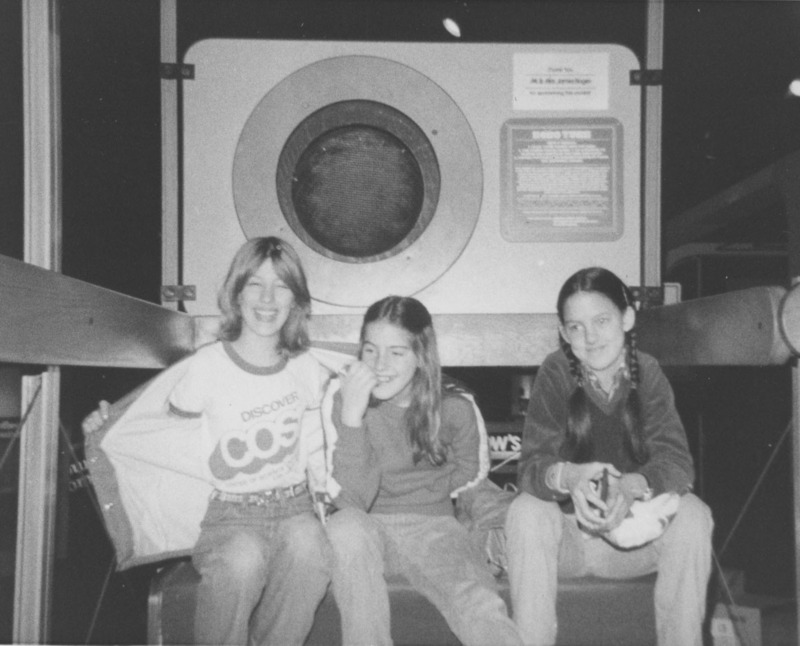 Overnight at COSI was a favorite of the girls and the leaders. Sleeping on the cobbled street of yesteryear was not the leaders' favorite but after chasing scouts all day we were ready to sleep anywhere. Roxanne Weber became one of our co-leaders. When the girls moved to the Galena School for 6th grade, the troop met in the Galena Methodist Church. The following year we moved to the Hopkins House (now the Myers) Inn for meetings. As the girls grew older community service took on new meaning. Working with Dan Daugherty and the village, the girls ringed and mulched the 93 trees on the square. One of my scouts was interested in recycling and helped coordinate and man the first community recycling center at the Methodist Church. The center was only open one day a month and local people needed to be on hand to sort and load the trucks. Glass was crushed in metal barrels. She would call others to help and was there each month on recycling day. - - -Eventually recycling bins were brought to Sunbury so residents can recycle anytime. Community Library moved into temporary quarters while the Town Hall was renovated in 1982. The troop organized the packing and unpacking of the boxes of books. To prepare to do this each scout had to learn to read shelves so they would understand how the books were shelved. They learned to load boxes upside down and backwards so when they were opened in the new facility they were ready for the shelves. The moving company was not the best and chose to ignore the scouts as well as the library staff but the girls continued with their project until all books were located in the temporary facility. When the renovation was done, the girls again helped move the books back to the Town Hall. 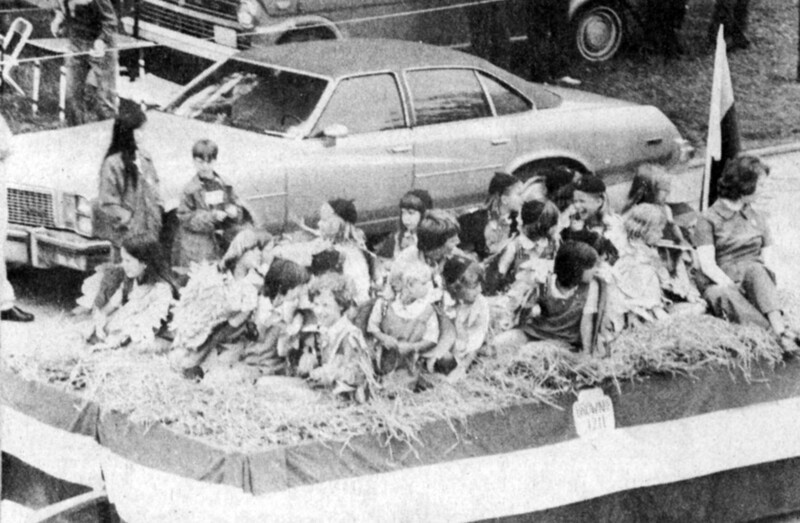 Christmas on the Square is a tradition started as a girl scout community service project. Community Library ask merchants to join them in a Hanging of the Greens evening. Merchants were asked to stay open and invite the public in for refreshments and get the community into a holiday mood. The Hopkins House belonged to the library. Our girl scout troop served food from a Moravian Love Feat to anyone who would come. They baked the love cake, decorated the building with traditional Moravian Christmas decorations and sang carols. - - - The following year the boy scouts ask if they could bring a yule log to the square. Another girl scout troop wanted to decorate international Christmas trees. Thus Christmas-on-the-Square was born and still is celebrated the first Saturday night in December. Slate Run Metropolitan Park was just getting started when out Troop opted to spend their camping time at the park and work on the 1880 farm. Each day the girls left their campsite and literally became the farm children of a century before. They mucked stalls, fed the livestock, gathered eggs, baked bread, churned butter, pieced and sewed potholders, weeded the garden, washed the clothes and prepared meals for the farmhands. I will never forget the horror of the girls watching the chickens beheaded. They quickly rallied and plucked the feathers so enjoy the chicken and noodle dinner they prepared. The metro staff was wonderful and shared yesteryear in the form of old cookbooks, hayride, rope making and all the other tasks a family had to do to survive. Some girls tried their had and driving the horses and quickly decided it was more work than it looked in the movies. The Girl Scouts also learned period games, songs and stories. On their last day there, the park had provided clothing for them to wear and they were the docents for the visitors to the park. Usually the trips were to Cedar Point of King's Island. 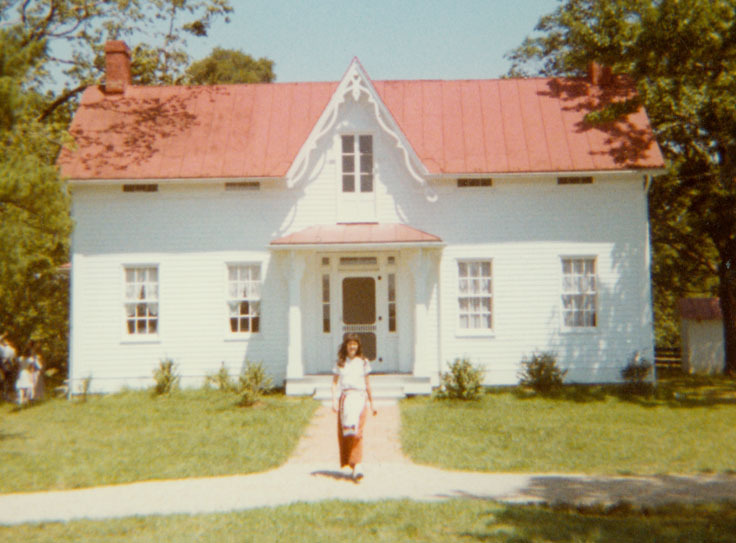 I remember Mrs. Mathew's troop going to a National Round-up or Camporee and to Savannah to Juliet Low's home. The girls in Mrs. Christie Manor and Mrs. Gernert's troop were the first to complete Silver. The following year our troop became the first to complete Gold requirements. Our troop disbanded when the girls graduated from high school. 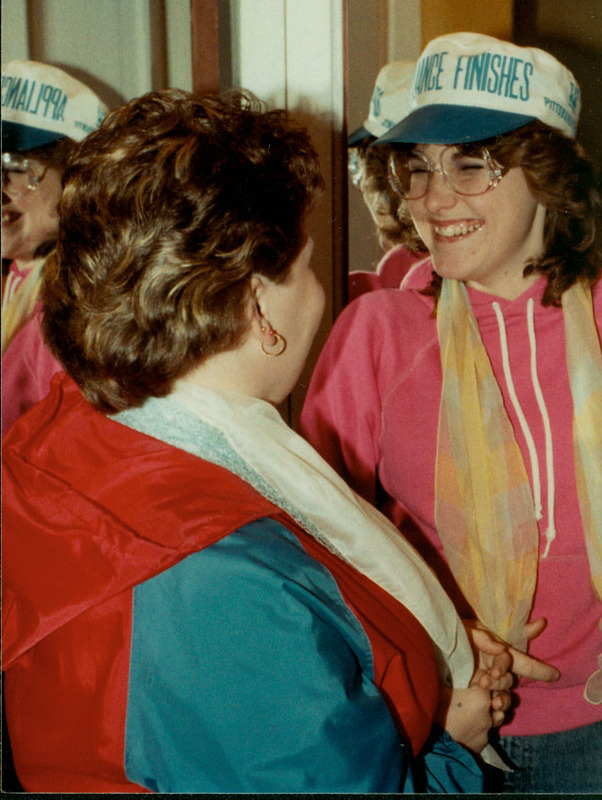 Today these women are mothers, leaders in the community and many work with Girl Scout troops. I know their scouting skills are being used.